Coming soon is mulid ilnabi مـُلـِد ا ِلنـَبي (the Prophet's birthday). This year, it comes two days before Aeed ilmilaed عيد ا ِلمـِلا َد (Christmas). Jesus Christ is regarded a prophet by Muslims, so his birthday is celebrated with the same enthusiasm as that of the Prophet Mohammed: that means there will be two festivals in the same week this year. If you wonder why the dates of Muslim festivals change every year, check out this item about the hegriya calendar. Most of the Muslims in Egypt are Sunnis. The Shiite Fatimids ruled Egypt from 969 to 1171 but, as soon as they left, the majority of Egyptians returned to Sunni ways. There are still Shiites in Egypt, but they are a small and persecuted minority. One Shiite tradition that the Sunnis did adopt is giving away sweets at religious festivals. 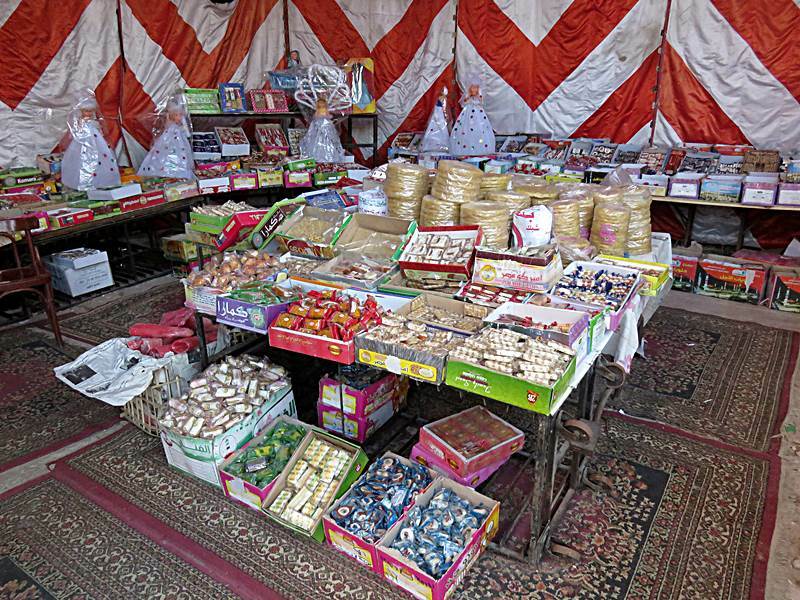 Originally, people would bake their own cookies or sweet biscuits: these days, bakeries start selling Eid cookies about a month before the festival, and street vendors set up marquees to sell both traditional sweets and also pre-packaged commercial biscuits in festive presentation boxes. With two festivals in the same week, the children in Egypt are going to be very happy!